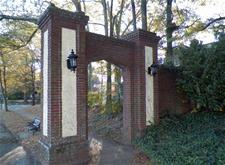 The City of Avondale Estates is pleased to announce its historic western gateway monument, Carl’s Corner, will be stabilized and repaired thanks in part to a $9,270 grant from the Historic Preservation Fund, administered by the Historic Preservation Division of the Georgia Department of Natural Resources. The City’s 1920s-constructed red brick and stucco ceremonial entrance archway, named after early Avondale Estates gardener Carl Houseworth, is located at the corner of South Avondale and North Avondale Roads. It was referenced in 1986 as a contributing feature to the National Register of Historic Places District. Citizens interested in maintaining the historic features of the City expressed concern over the condition of the archway, and an interest in telling its story. Letters of support from local residents, boards and commissions and the DeKalb History Center helped secure the grant funds for this project. The Historic Preservation Division (HPD) covers 60% of the project cost up to $9,270, and the City is responsible for the remaining cost. Avondale Estates is one of seven Georgia communities this year to receive federal subgrants to conduct historic preservation projects, all of which will begin in April 2014 and be completed by September 2015. The HPD awarded a total of $83,471 in grants, and Carl’s Corner is one of just three brick-and-mortar rehabilitation projects. As one of the state’s 87 Certified Local Governments (CLG), Avondale Estates is eligible to apply for these grants every year. To become a federal CLG, a city or county must pass a preservation ordinance and establish a historic preservation commission. The CLG program is one of the most important community stabilization and revitalization tools, according to HPD Division Director David Crass. “By becoming a CLG, neighborhoods take control of their own economic destiny and gain access to HPD technical expertise and assistance that helps them protect those resources which make them unique,” Crass said. Avondale Estates is also finishing up another HPD-funded project: a citywide Historic Resources Survey. This project will be completed by late spring/early summer. The Historic Preservation Division (HPD) of the Georgia Department of Natural Resources serves as Georgia’s state historic preservation office. Their mission is to promote the preservation and use of historic places for a better Georgia. HPD’s programs include archaeology protection and education, environmental review, grants, historic resource surveys, tax incentives, the National Register of Historic Places, community planning and technical assistance. The mission of the Department of Natural Resources is to sustain, enhance, protect and conserve Georgia’s natural, historic and cultural resources for present and future generations, while recognizing the importance of promoting the development of commerce and industry that utilize sound environmental practices.